Hey you! Sushi and tartar lover! I have a treat for you! You’ve probably already heard that the biggest trend right now are beautiful bowls of food! 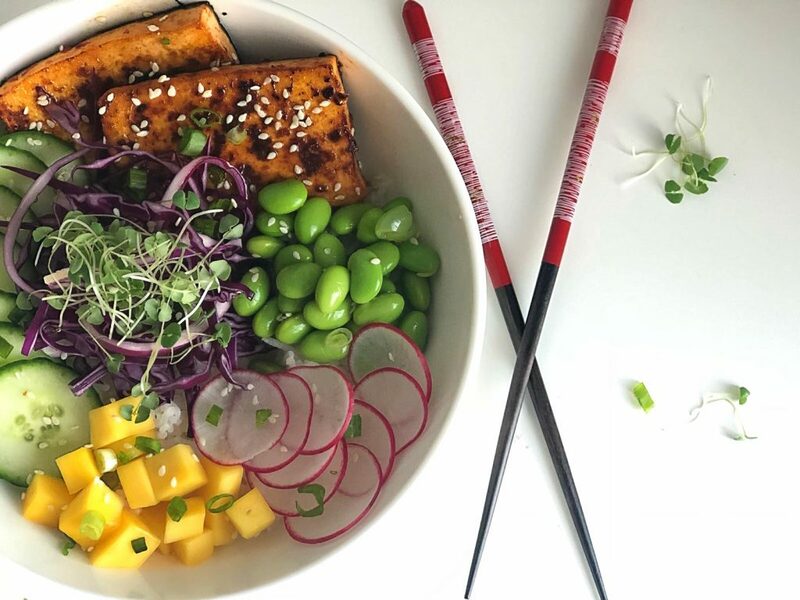 When you think of the Poké bowl you automatically think healthy! Not only does it seem healthy, but it actually is! 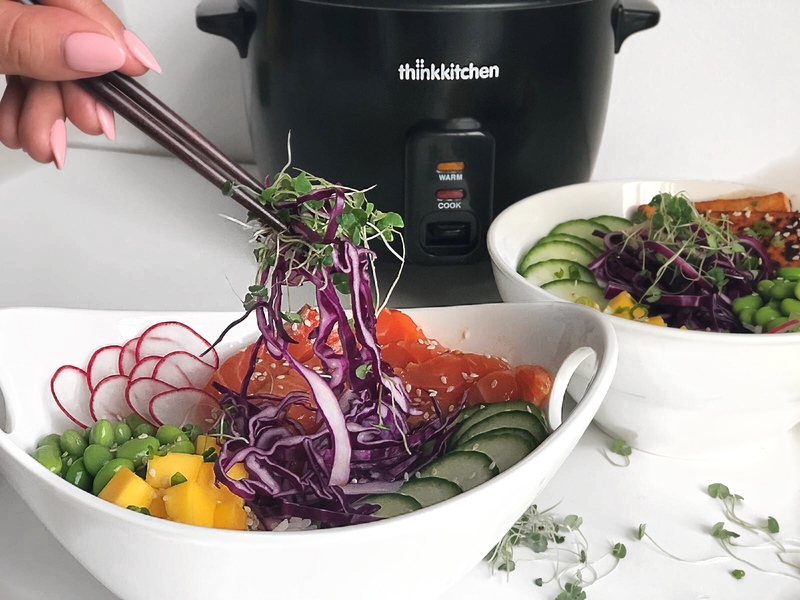 With fresh biological products, you can create this amazing Hawaiian bowl fresh enough to take you back to the warm summer days (we already miss)! What’s even better is that you can eat until you are completely full and not feel guilty about it. This bowl is filled with fresh Asian flavours, but I’ve added a little twist…the famous Sambal olek that I am obsessing over! Get creative! Mix all the ingredients for the marinade in a small bowl and make sure the texture is smooth and homogeneous. Marinate the salmon or the tofu in the sauce for at least 2 hours in a bowl or a sous-vide bag in the fridge. During this time, measure 3 cups of rice. Rinse it in water and drain. Place the rice in the rice cooker bowl. Add 3 1/2 cups of lukewarm water. Turn on the thinkkitchen rice cooker and let it cook for about 27-32 min. Once it is ready, let it cool. During this time, wash your vegetables. After chopping all the vegetables, take the marinated tofu, place it in a pan on medium-heat and cook for about 20-30 seconds on each side. For the salmon, you can take it and cut it either like tartar or tataki. Once everything is ready, place the rice, the protein, the vegetables and all the other ingredients and place like the above photo. What’s great about this is that you can have fun with it and decorate your plate as much as you’d like! And don’t forget to pour the sauce over for the final touch! This will give more flavour to your amazing creation. Who is La Classe TV? LaClasse.TV gives you the best coaches and VIP access to their online hub. Their mission is to offer you a unique academic experience as well as high-quality online training. Courses are available in french only.